A gazebo is the kind of structure you’ll want to have when the time comes to entertain guests, and when you just want to spend your relaxation time outdoors. The weather is beautiful! And what better way to accommodate the sunshine than by building the perfect place for you to enjoy it? A gazebo is the kind of structure you’ll want to have when the time comes to entertain guests, and when you just want to spend your relaxation time outdoors. If you’re looking for the perfect gathering place this spring, take a look at why a new gazebo is right for you. Depending on your available space and how you want to use your gazebo, you’ll probably be making a lot of adjustments to the design. One of the greatest parts about a gazebo from Mid-Atlantic Deck & Fence is that you can completely customize the structure. Whichever designs and aspects you choose is based on how you want to use your gazebo. There are many different designs and materials to choose from, and each will present you with all the benefits of a beautiful gazebo. Your outdoor fun doesn’t have to stop when the spring showers start. You don’t have to worry about grilling in the rain. A large enough gazebo can accommodate a grill and the seating arrangements to help entertain your guests. An occasional rainstorm could add a bit of outdoorsy romance to the situation. You’ll want to make sure your gazebo gives you the option to enjoy the outdoors rain or shine. It’s easy to hang and pot plants around the perimeter of your gazebo. There are no limits to how you can decorate your gazebo with flora, which makes the structure perfect for the spring season. You can create your own personal gardens with climbing vines, hanging plants, or tall potted trees. Whatever you choose is up to you–a gazebo is yours to customize! 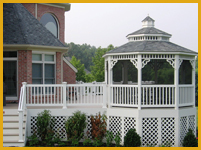 Work with Mid-Atlantic Deck & Fence today in order to achieve the perfect gazebo design!